While some home buyers may find the concept of building a custom home from the ground up a little intimidating, there is a way for them to enjoy some of the best aspects of a custom experience – without the headaches of starting from scratch. Often, when a buyer elects to build the home of their dreams – they must contend with finding the right house plan to fit their vision and needs, selecting the ideal location (and making certain that it’s a good match for their house plan), and partnering with the perfect builder (one who is not only reputable, but who is also willing to build the plan of the homebuyers’ choosing on their desired site). That’s an awful lot for many home buyers to bite off from the get-go – thus the wild popularity of spec or production houses. However, if a home buyer is lucky enough to find a semi-custom home in its early stages – that just happens to feature a floorplan they love in a location their family will enjoy – they can still experience some of the great joys and benefits of custom home construction. 1) Special Touches – Always wanted a window seat for reading, walls of built-in bookcases to house your library, or a window over your kitchen sink for gazing out over the backyard? Special touches like these are fairly simple to incorporate when partnering with a custom/semi-custom builder who already has a house framed out or foundation poured. 2) All the Bells and Whistles – When getting in on the ground floor of a semi-custom home, you have an opportunity to select EVERYTHING that will make up your home’s interior – from exposed beams and specialty light fixtures in the ceiling, to door knobs and drawer pulls at the surface, to floor registers and hardwoods beneath your feet. You may even wish to kick it up a notch and follow the high tech house trend by integrating a complex system that allows you to control the lights, audio, heating, security and even the TVs in the house with the touch of a button. 3) Put on a Happy Face – If you get into a contract on a semi-custom home early enough, you may also have the chance to select the materials that will define your home’s exterior – something that should make you deliriously happy every time you pull into the driveway. You may select a combination of stonework, timber and Hardiplank for a look of luxury, a red brick front with pale mortar for a more traditional feel, or a Hardiplank with contrasting trim that pays tribute to the Arts and Crafts movement. 4) Down and Dirty – Landscaping can enhance or detract from the beauty of a home, and a great backyard can extend one’s living spaces outdoors. While many production and spec builders will supply basic pre-designed landscaping packages that consist of trees and shrubbery available through their supplier, a good custom/semi-custom builder will provide you with an opportunity to have as much say in the look of your landscaping as they will with the actual structure at the heart of it all. Always wanted a potting shed that looked like a miniature version of your home? Good luck getting that from a production builder. Highlight Homes currently has 5 semi-construction projects all over Atlanta – two of which are already under contract. To learn more about the homes we are building or discuss a custom home project on land you already own, we invite you to contact us at info@highlighthomesga.com or 678-873-9234. 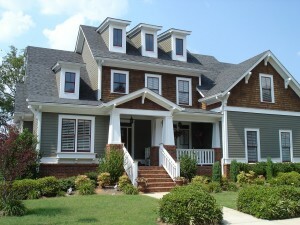 To view samples of our work as an award-winning luxury renovator and custom homebuilder, we encourage you to visit us online at www.highlighthomesga.com.